Junipers are conifers of the genus Juniperus. Experts do not agree on the total number of species, some insisting there are only 52 juniper species while others accept 67 species. They are native to the northern hemisphere, from the arctic circle to the tropics. Some junipers are given the common name of cedar. This is incorrect; cedars belong to the genus Cedrus. Depending on the species, junipers can grow from 4 inches to 50 feet tall and have a spread from 6 to 20 feet. 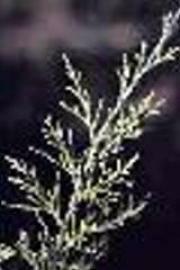 The foliage colors are equally varied, from a silvery-blue through a range of greens to bronze, yellow, and even purple.All junipers are evergreen, though the leaves can be either scale-like or needle-like. The needled leaves are hard and sharp, making the plant quite prickly to handle. The seed cones resemble berries, usually blue. Juniperus virginiana was the traditional Christmas tree in the southern areas of the United States, chosen for their natural conical shape and the ready supply. They are grown commercially for this purpose today, and are among the most popular Christmas trees in North America. Eastern red cedar matures up to 50 feet tall and 20 feet wide. The tree has dark green foliage that turns reddish in cold weather. The berries are dark blue to a pale blue-green. The wood and foliage are aromatic. In the wild, these trees have been known to go dormant in shaded sites, then photosynthesize again when surrounding taller trees are dormant. Many cultivars are grown today, with a wide variation in color. All junipers do well in sites with full sun and good drainage. They withstand heat and drought better than many garden plants. They will grow in acidic or alkaline soils. Very few junipers are tolerant of shade or poor drainage. They do not respond well to heavy pruning, so consider the mature size of the specimen before planting. Balled and burlapped junipers do best if they are planted in the fall. Container-grown junipers can be planted any time of year. Junipers are propagated by seed, cuttings, layering and grafting. The range of size, shape, and color found in junipers makes them invaluable garden plants! They can be groundcovers, shrubs, or trees. They are grown for erosion control on banks; as foundations plantings; and as screens, hedges, and windbreaks. Juniperus chinensis (Chinese Juniper), as well as several other species, is a very popular tree for bonsai. It is a symbol of longevity in some Asian cultures. Juniper berries are used as a flavoring in cooking and in the distillation of gin. Juniper oil was used as a laxative by Egyptian doctors as early as 1550 BCE. Native Americans used the berries and leaves to treat wounds, arthritis, and infections, and the Zuni used the berries to assist in childbirth. British herbalists used herbalists used it to promote regular menstruation. In 19th century America, herbalists used juniper in treating urinary tract infections and congestive heart failure. It had to be used with care, however: six drops of juniper oil can have a toxic effect. Juniperus scopulorum 'Gray Gleam' -- 20 feet tall; slow grower; gray-green foliage. 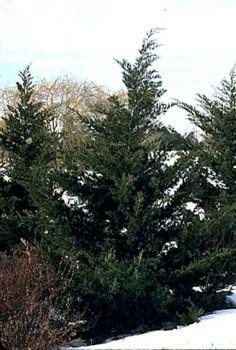 Juniperus scopulorum 'Skyrocket' -- 15 feet tall by 2 feet wide; blue-gray foliage, 18 feet or taller. Some junipers are susceptible to Gymnosporangium rust disease, otherwise known as apple rust fungus, which can be a serious problem if planted near apple trees, the alternate host of the disease. Phomopsis tip blight and Phytophthora root rot are occasional fungal diseases.Pests include bagworms, juniper webworms, and twig borers. Juniperus - Evergreen shrubs and medium-sized trees, natives of northern and temperate countries. The wood of some kinds is fragrant, and the foliage contains an acrid principle as in the Savin. The Junipers vary much in size and habit in their native countries owing to their usually wide geographical range, and to growing in all sorts and conditions of soil and climate, so that, probably, mere forms of varieties have been considered species. Some are too tender for our climate, although of much value in their own, while others are quite hardy and vigorous with us. Such beauty as the hardy kinds possess is very much diminished by the common way of planting them among shrubs; or, in the case of the pinetum, isolating in grass, both ways being against their good effect and good cultivation even. Where possible, the really effective way is to group them. The good effect of this is well seen in the case of the common Savin, as indeed it would be in most of the others, and where there is no room to do this, and do them justice, it would be better to leave them out altogether, as, starving in the embraces of the common British shrubbery, they soon come to a bad end. The Winter-flowering Juniper (Juniperus Chinensis) - A low tree or bush, hardy and useful in gardens, as during winter or in early spring, when covered with its yellow male flowers, it is beautiful, and of the easiest culture, succeeding well on loamy soil; several varieties are in cultivation. J. Japonica is thought to be an alpine form of this. The British Juniper (Juniperus Communis) - Chiefly found growing in England on sandy or chalky soils or on open downs, while in Scotland its native home is amongst the granite or trap on hill and mountain sides. The Irish Juniper is a close erect form, not confined to Ireland, but occurring also wherever the Juniper is plentiful. J. communis varies much in gardens, and we often see forms of it where the wild plant is never cultivated, though we doubt if any of the varieties are better, if as good. The Swedish and Canadian Junipers are supposed to be varieties of this. J. oxycedrus is the Mediterranean representative of our common Juniper, but in our climate it does not generally thrive. Plum-fruited Juniper (Juniperus Drupacea) - A native of Syria and Asia Minor, on the mountains there attaining a height of some 15 feet. Thrives in gardens best on good, well-drained soil. It has a close, conical habit of growth, with branches of a light grassy-green color. This Juniper makes a good tree for a lawn. The fruit is a fleshy one, enclosing a hard kernel, about the size of the Sloe, and of a plumlike purple. Tree Juniper (Juniperus Excelsa) - A graceful tree native of many countries in Northern India, Persia, Arabia, and Asia Minor, in some of the most favourable conditions forming large forests at very high elevations. A close tapering form was sent out from Messrs Rollissons nurseries as J. e. stricta, and is a very glaucous and attractive shrub. Phoenicea Juniper (Juniperus Phoencea) - A shrub of conical form from the Mediterranean region, the male and female flowers on the same plant but on different branches. Although long introduced to England it is as yet far from common. Weeping Juniper (Juniperus Recurva) - A distinct kind with graceful drooping branches, from the mountains of India and Cashmere, varying in size from a low bush to a medium-sized tree according to climate and soil. The male form is more close in habit than the seed-bearing one. A graceful kind for banks or the outer flanks of the rock garden. At Brynmeirig, near the Penrhyn slate quarries, there are a number of these graceful Junipers, which for size are perhaps not excelled in Britain. The soil is loam and peat resting on shaly slate rock-the situation is shady and with a northern aspect, which seems to suit this species. Mount Hakone Juniper (Juniperus Rigida) - A graceful and picturesque kind with free and often drooping habit, and in S. England at least vigorous and hardy, assuming in autumn and winter a pleasant bronzy hue of green. It has not been long enough in cultivation to judge of its stature or permanent habit and value in Britain, but it promises well. Japan. Savin (Juniperus Sabina) - A hardy and plumy bush of the mountains of Europe, few evergreen shrubs being more beautiful. In the garden at Goddendene, near Bromley, a dwarf form is very prettily used as a lawn plant. Among the varieties of the Savin the most useful forms are J. prostrata and J. tamariscifolia-variegated ones, as usual, being ugly and useless. Frankincense Juniper (Juniperus Thurifera) - A small distinct tree, in its native country attaining a height of 40 feet. As a lawn tree it is attractive, and from its dense conical shape associates well with trees of the same race, and is very hardy. Spain and Portugal. Dwarf Junipers for the rock garden: Small forms of the northern Junipers are used on rock gardens with good effect, as giving on a small scale the form of the alpine Conifers. Among these are J. nana and Echnioeformis, and other dwarf forms.